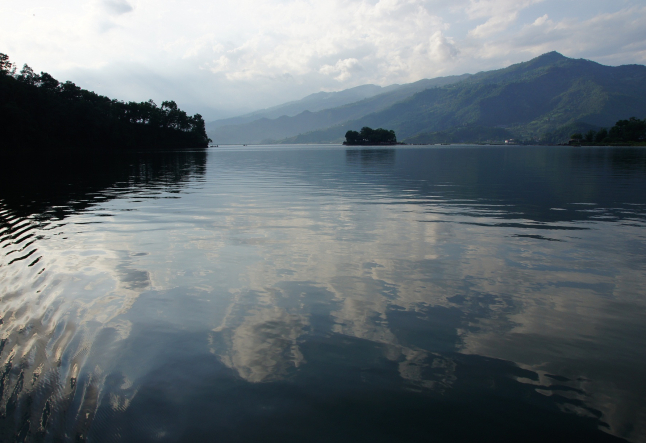 Hidden between the Himalayan mountains, in the centre of Nepal, lies the village of Pokhara. 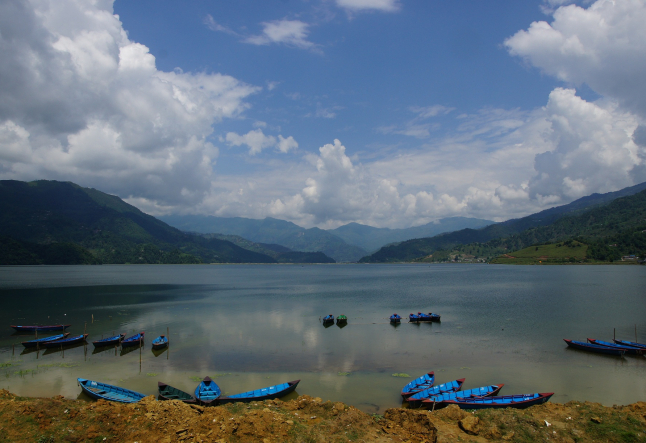 The name Pokhara originates from the word Pokhari, which means lakes. Of all the beautiful lakes Fewa is the largest and most popular one. Big and smaller settlements surround the lake, as well as on the nearby mountains. Pilgrims are attracted to Pokhara for its sacred Hindu and Buddhist sites, while other travellers are drawn to this village for the mountains to do trekking. The serenity and the overall energy of the birthland of Buddha makes it is also perfect for yoga and spiritual trips. Devika Gurung (34) saw the potential and started her own yoga studio in Pokhara in 2000 shortly after she discovered the bliss yoga brought upon her own life. Devika was born in a rural village in the Annapurna mountain region and was one of six children. The hard village life forced her to leave school at the age of 15 to support her family who were struggling financially. Three years into doing a variety of hard labour work, such as working on a construction site and making carpets, she met two Australian yoga teachers at a Buddhist monastery who first introduced yoga to her. Together they did Hatha yoga several hours per day, three months in a row. She continued her yoga studies in Kathmandu, the capital of Nepal, and was able to establish her own yoga centre a few years later in Pokhara with the financial help of her Dutch godparents, who she also met at the Buddhist monastery. The Nepali culture is a very colorful one, but despite of its tasty national food and joyful folk music, the country also struggles with an ethnic unrest. While the law states that Nepali men and women receive equal rights, unfortunately many women face a different reality. Having experienced this personally, Devika was determined to make a difference. Through yoga she evolved to a strong willed poised woman ready to selflessly give. Together with Emma Despres (UK) she founded Nepali Yoga Women Trust in 2007. Emma had visited Pokhara earlier that year to do voluntary work and stumbled upon Devika’s studio looking to do some yoga. Their connection was immediate; they spent time together doing yoga and other trainings. Their similar perception on life and their strong will formed a stable fundament to build a charitable trust on. Nepali Yoga Women Trust focuses on women who have been abused, thrown out of their home, harassed or victimised by society. The foundation helps Nepali women develop skills that allow them to reposition themselves in society and become independent. Nepali women living in low-income households are often discriminated against from a very young age. Particularly in rural areas where religious and cultural traditions are known to be the main causes. They often receive a lesser amount of food than boys, along with more work starting as children and fewer opportunities for education. Families will arrange marriages for their daughters when they are an average age of 16, of which half will at least have one child by the age of 20. Once married, a woman holds the lowest position in her husband’s family and is judged generally on her ability to produce male children and work hard. Male children gain status in their families’ eyes. 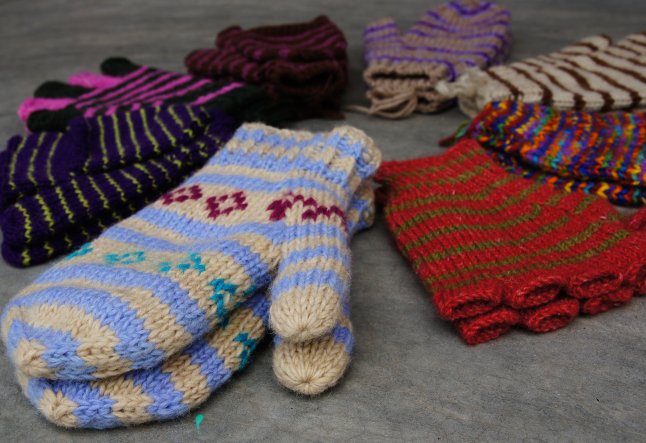 “They work physically very hard but are also expected to take care of the family” says Devika. Women in Nepal fulfill stereotypical roles confining to the household and often deal with abuse and sexual harassment. Due to the discrimination in employment opportunities women are mainly working in the informal sector, where they do their work thanklessly and often without/receive lower wages than men. They silently carry the weight of society on their backs. Nepali Yoga Women Trust wishes to support women who want to break out of the role that society dictates. These women are hungry to learn and strive for independence. They are strong women, who are setting a great example that has the potential to change the way women are viewed and treated in the entire nation. “The harsh social conditions many Nepali women face do not define them. In life we move forward through positive thinking. It is only then we are able to make a change,” states Devika. Devika believes in a practical way teaching. “The more skills they develop, the more opportunities they will have” she says. The seven women who are currently at the center spend their days learning English, yoga, holistic therapies, self-healing techniques and making handicraft. These activities encourage the inner-transformation of these women. The sale of their handicrafts offers them economic independence. They are able to allocate money for personal needs and enrich the lives of their children, who are often also deprived of an education and discriminated against. Over time Devika has seen the women become self-sufficient, confident and less reliant on others. Since the beginning of Nepali Yoga Women Trust, Devika has spent the high tourist season (autumn and spring) teaching twice-daily hatha yoga classes at the centre, and heads to the north of India for further training in the low season (winter and summer). Emma invited Devika to the UK for first time in 2007. Fortunately her network has expanded greatly over time and has made it possible for her to travel to Europe to give yoga and spiritual workshops to raise awareness and funds for her foundation. The donated money goes directly towards the training of the women at the centre, salary, house rent and financially supporting those who have been abandoned with their children and are left with nothing. This summer she will visit France, Belgium and The Netherlands.